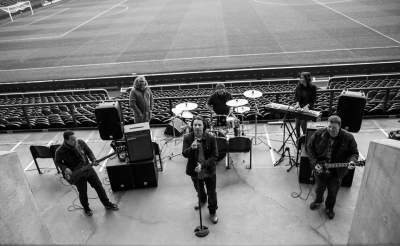 WOUNDEDSPiRiT are a Indie-Stadium Pop/Rock band from West Bromwich in the UK. On the cusp of making it, WOUNDEDSPiRiT were drawing big fanbases and gaining backing from some big names in BBC Radio 1(Steve Wright, Mark Goodier), WOUNDESPiRiT were on track in positioning themselves as the anthemic rock band of the 90s, yet to the dismay of their fans in the midst of their success in becoming an exciting emerging band, WOUNDEDSPiRiT mysteriously disbanded, leaving their fanbase and peers staggered and without reason why. Now after the being overwhelmed by the response from newly reunited fans from what was originally a one off reunion show. WOUNDEDSPiRiT are making a triumphant return, recording new material and revisiting past demos with Producer Gareth Young(All saints, Ronan Keating) which left audiences baited during WOUNDEDSPiRiT’s heyday. WOUNDEDSPiRiT consist of Jason Kelly on Vocals, Elton Mctaggart on Drums, Terry Ebanks on Bass/vocals, Biggsy on Guitars and Debbie P on keyboards/vocals influenced by Simple Minds, U2, The Alarm, Tears for Fears to name a few, WOUNDEDSPiRiT have developed a sound of big guitars, thundering percussion, yet have an uncanny ability to give space for memorable melodies and thought provoking words.